Birthday Girl Nicol Makes It Asian Games Gold No.5! After a glittering squash career in which she has won every prize on offer, Malaysian superstar Nicol David could hardly have dreamed of a better way of celebrating her 35th birthday than by claiming a record fifth Asian Games gold medal - 20 years after winning her first. The former world number one - a title David held for an unprecedented 109 months in a row - defended the title she last won in Incheon in 2014 after again surviving a final against a fellow countrywoman. This time, at the Gelora Bung Karno Sports Complex in the Indonesia capital Jakarta, David had to fight back from 2/1 down to overcome teenager Sivasangari Subramaniam - her undoubted successor - 11-13, 11-9, 5-11, 11-6, 11-8 in 52 minutes (both pictured above in final action). While David was marking her sixth successive appearance in the event - the only player in Jakarta to have also competed in the inaugural event in Thailand in 1998 - Subramaniam was making her debut. The 19-year-old 5/8 seed from Kedah claimed two of the biggest scalps of her brief career to reach the final, seeing off second seed Annie Au in the quarter-finals, then world No.16 Joshna Chinappa in the semis to set up a meeting with her idol for the first time. "It's always nice to win the gold for Malaysia," David, from Penang, told www.squashmad.com . "This win also means a lot to me too as this is likely my last Asian Games. "Of course it was a really close battle too. Sivasangari came into the final having won the biggest matches in career and she had that momentum going. I knew it was always going to be tough and true enough it went to five. I'm really pleased with my performance in the end. "But I'm also really proud of Sivasangari. She has trained hard and she showed that she can stand among the best too." The impressive Subramaniam (pictured above, left, with David) added: "I'm satisfied with my individual showing. I had an amazing run and I got to play Nicol. It's certainly a dream come true for me but it's now on to the next one, which is the team event." 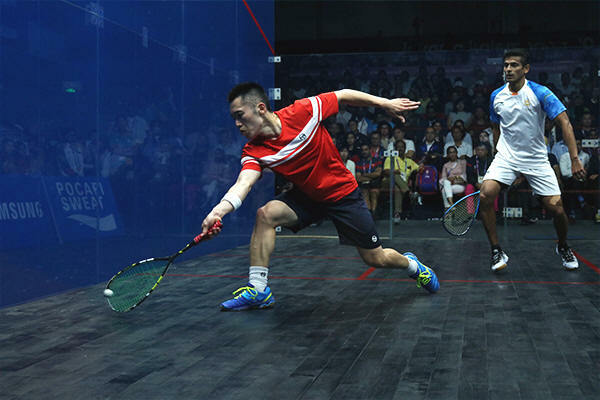 The men's final was also a one-nation affair in which second seed Max Lee, the Hong Kong No.1, faced domestic rival Leo Au, the 3/4 seed (both pictured below in action) who upset Indian favourite Saurav Ghosal to reach the final against the odds. Lee boasted a career 10-7 head-to-head advantage over Au going into the match - but only two months ago lost out to lower-ranked Au in the Hong Kong national championship final. World No.21 Au carried on where he left off on home soil, and defeated Lee 11-8, 12-10, 6-11, 11-4 to become the first Hong Kong player to claim gold in the men's event. "I think both Max and I played very well today," said the 28-year-old (pictured above, right, with Lee) afterwards. "I'm very happy that we made it a 1-2 finish for Hong Kong. "On a personal note, I feel that I've finally made it happen for myself. All my hard work and perseverance has finally paid off. I've proven to myself that I can actually do it!" 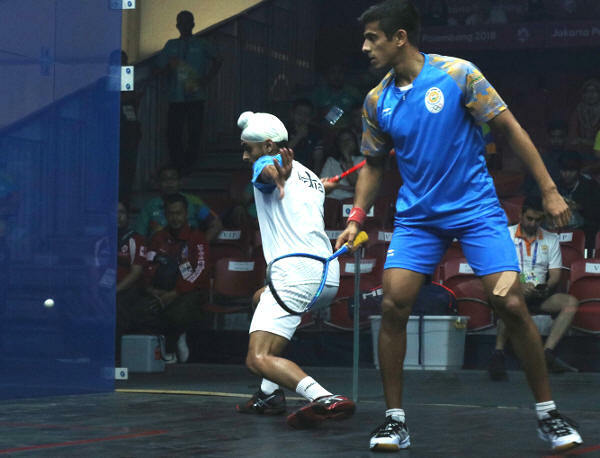 After a dramatic Squash semi-finals day in the Asian Games in Indonesia, both Malaysia and Hong Kong China are certain to strike gold in Sunday's finals at the Gelora Bung Karno Sports Complex in Jakarta. Malaysian teenager Sivasangari Subramaniam continued her giant-killing run in her maiden appearance in the Games by taking her second world top 20 scalp in 24 hours. 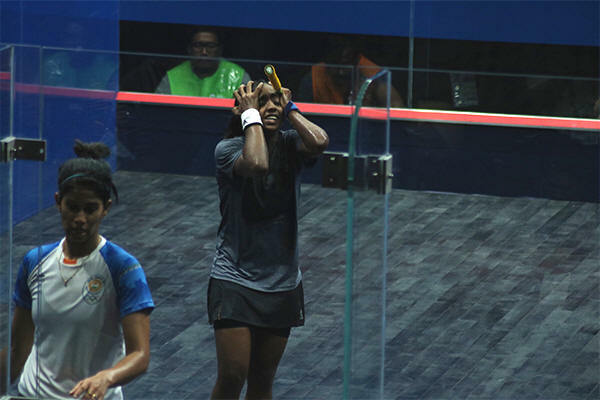 After despatching top seed Annie Au in the quarter-finals, the 19-year-old world No.40 battled for 41 minutes to overcome Joshna Chinappa, the world No.16 from India, 12-10, 11-6, 9-11, 11-7 to secure a surprise place in the women's final. 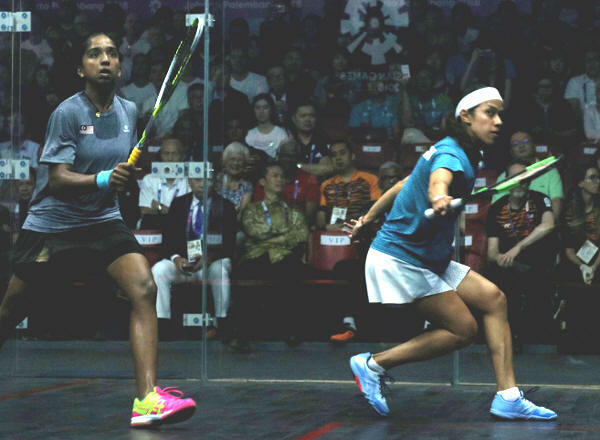 The 5/8 seed from Kedah will now face compatriot Nicol David, the illustrious former world number one who reached the final for the sixth time in a row after seeing off Indian rival Dipika Pallikal Karthik 11-7, 11-9, 11-6. "I really can't believe it," Subramaniam (pictured above) told www.squashmad.com . "First beating Annie and then Joshna today - both of them are top players on the world tour. It feels really amazing to get into the final in my first Asian Games. "I know I had nothing to lose today and even though Joshna came back really strongly to take the third, I just kept my focus and did what I needed for the win. "But it's not the end yet. I have another big match against Nicol. It will be my first time playing her and it's really like a dream come true but I just have to stay focused and give it everything I have." David, now one win away from a phenomenal fifth gold medal in 20 years, will contest the 2018 final on her 35th birthday. "I'm pleased to win my match today and I felt good going up against Dipika who is a tough contender," said the favourite from Penang. 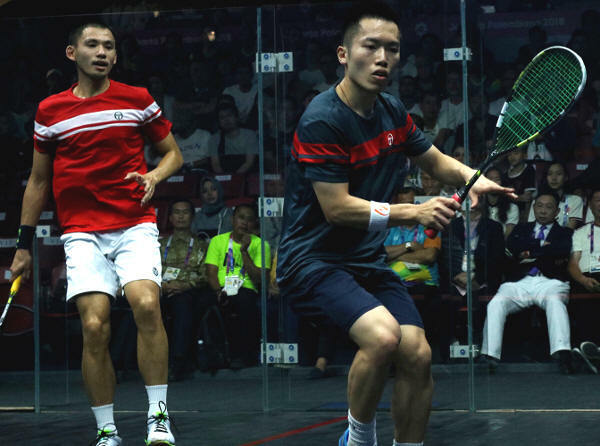 The first ever all-Hong Kong men's final was set up by outsider Leo Au, the 3/4 seed who denied Indian number one Saurav Ghosal, the top seed (both pictured above), a place in the final for the second successive time after fighting back from 2/0 down to upset the world No.12 10-12, 11-13, 11-6, 11-5, 11-6 in 76 minutes. 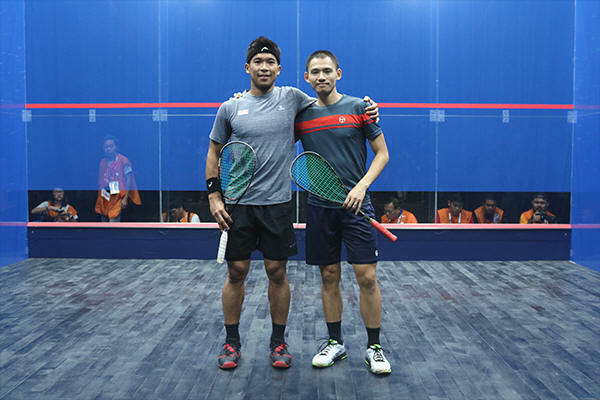 Au, the reigning Hong Kong champion, will now line up against domestic rival Max Lee after the second seed was also made to fight back from two games down before beating Malaysian Nafiizwan Adnan (pictured below, left, with Lee) 5-11, 6-11, 11-5, 11-5, 11-9. "I think today, I was able to be more patient and stay focussed (despite being two down) right till the end," said 28-year-old Au, ranked just two places in the world lower than his compatriot. "I'm happy that it's an all-Hong Kong final tomorrow. "We will give our best as we've already achieved our team goal," added a delighted Au. 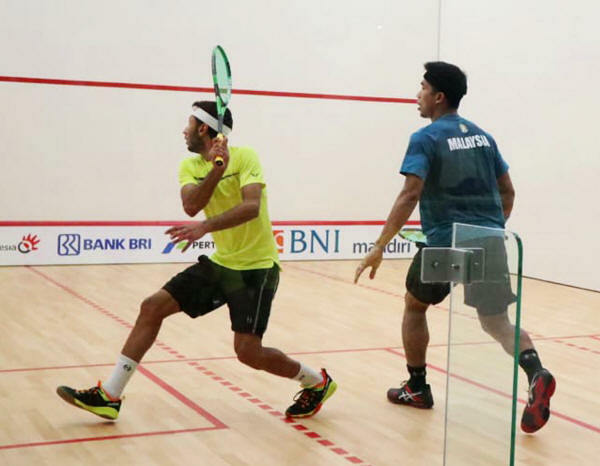 Against expectations, Malaysia are in line for a triple squash medal haul in the Asian Games in Indonesia after Nafiizwan Adnan and Sivasangari Subramaniam, both 5/8 seeds, pulled off major upsets in today's quarter-finals at the Gelora Bung Karno Sports Complex in Jakarta to secure places in the semi-finals for the first time in their careers. Subramaniam, a 19-year-old from Kedah, scored the biggest win of her career when she beat second seed Annie Au, the world No.11 from Hong Kong, 11-9, 11-13, 11-5, 3-11, 11-5. "I still can't believe that I've managed to produce a win over Annie," the jubilant Subramaniam (pictured above, left, in quarter-final action) said afterwards. "She's the second seed in the tournament and ranked as high as number 11 in the world. 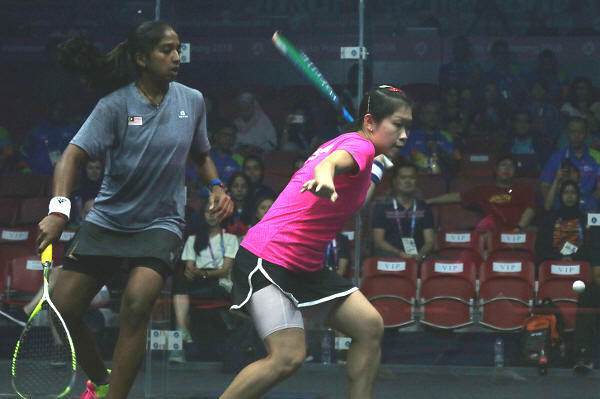 "I went on court just looking to play my best squash, which I did and I'm just so happy to get through to the semi-finals in my first Asian Games," continued the teenager who recently won the Malaysian national title. "It's really a big thing getting through into the top four but now I have to reset and focus again because I have another big match tomorrow." The player she will now face in a bid to reach the final is Joshna Chinappa, a 3/4 seed from India who needed four games to overcome Hong Kong left-hander Joey Chan 11-5, 12-10, 5-11, 12-10. Adnan, who showed his potential only months ago in the Commonwealth Games in Australia when he won the bronze medal from the position of 12th seed, continued to defy the seeding in Jakarta by taking out Abdulla Al-Tamimi, a 3/4 seed. Ranked 12 places behind the Qatari, Adnan squandered a 2/0 lead before clinching his win 11-9, 12-10, 9-11, 5-11, 11-9 in exactly one hour. "It was really a tough fight but it's worth it because at least there will be a medal for Malaysia," said the 32-year-old world No.40 (pictured above, right). "I feel awesome and very glad to win today and contributing a medal to my beloved country, especially in this special "Merdeka" (independence) month. It was a tough match and now I am looking forward to a good rest this evening - and hopefully tomorrow, I'll do even better than today." Adnan progresses to face Max Lee, the No.2 seed from Hong Kong who ended Kuwaiti interest in the event when he beat Ammar Altamimi 11-5, 11-4, 11-7. 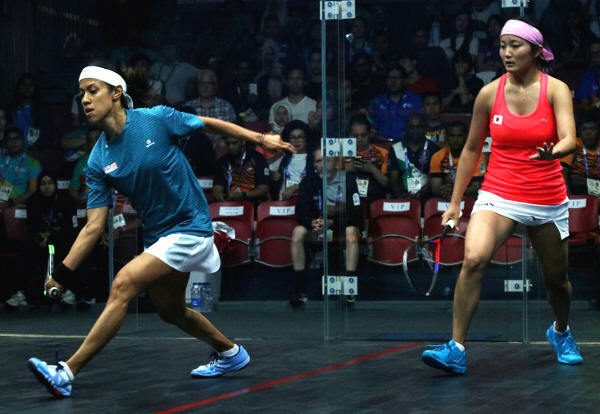 Nicol David kept alive her hopes of a record fifth gold medal when she despatched one of the women's game's rising stars Satomi Watanabe, of Japan, 11-6, 11-4, 11-3. "It's great to be in the semi-finals and I'm very happy with the way I played," said Nicol (pictured above, left), who now faces Indian rival Dipika Pallikal Karthik for a place in her sixth successive final. Top men's seed Saurav Ghosal, bidding to become the first Indian gold medallist in the event, had a tough quarter-final battle on his hands against fellow countryman Harinder Pal Sandhu. After dropping the opening game, the favourite regained control of the match to prevail 9-11, 11-7, 11-7, 11-7 after 70 minutes. The world No.12 from Kolkata (pictured above, right) now takes on Hong Kong's Leo Au in a bid to reach the final for the second time in a row. After two rounds of intense action on the opening day of Squash competition in the Asian Games in Indonesia, it is the top eight seeds who will line up in both the men's and women's quarter-finals at the Gelora Bung Karno Sports Complex in the capital Jakarta. All eyes are on Malaysian superstar Nicol David - the only player who has competed in all the previous five Asian Games in which squash has participated. It was as a 15-year-old that the schoolgirl from Penang burst onto the international stage at the 1998 Games in Pattaya, Thailand, where she claimed gold - going on to reach the finals in the next four quadrennial events, winning three further gold medals. Now 34, and the oldest player in the draw, David is seeded to defend her title - and moved comfortably into the last eight after seeing off China's Li Dongjin 11-8, 11-5, 11-1. The former world number one will now face rising star Satomi Watanabe, the 19-year-old from Japan who is the reigning Asian Junior champion. Making her debut in the event, Watanabe defeated Iran's Fereshteh Eghtedari 11-7, 11-5, 11-2. Watanabe is joined in the last eight by compatriot Misaki Kobayashi, the 28-year-old eight-time Japanese National champion who surrendered her title to her younger rival last year. Kobayashi's 11-5, 11-8, 6-11, 11-13, 11-9 victory over the Republic of Korea's Yura Choi means that Japan has two quarter-finalists for the first time ever. A new champion is assured in the men's event where India's world No.12 Saurav Ghosal is poised to strike gold after going down in a five-game 2014 final marathon in Incheon, Korea. The 32-year-old from Kolkata, a semi-finalist in the past three championships, reached the last eight after first beating Sri Lankan Shamil Wakeel 11-2, 11-2, 11-1, then taking out Pakistan's Tayyab Aslam 11-5, 11-3, 11-13, 11-8 in the second round. An Indian medal is assured as Ghosal will now face national team-mate Harinder Pal Sandhu, a 29-year-old from Chennai who made the quarter-finals for the first time after beating Robert Garcia, from the Philippines, 11-4, 2-11, 12-10, 15-13.